Amid a row over Amitabh Bachchan’s participation in second anniversary celebrations of National Democratic Alliance government in Delhi on Saturday, the megastar on Friday said he will be hosting a small segment regarding ‘Beti Bachao Beti Padhao’ campaign during the programme. When asked about being targeted by the Congress for “hosting” the event, Bachchan said, “I said what I had to, I think media has carried it as well. I have been invited to host a small segment for the programme. I am attached to a campaign called ‘Beti Bachao Beti Padhao’, that is the segment I am hosting. The actual show is hosted by Madhavan I am not hosting the show. “I am just hosting a small segment that is along with something else that I am doing for the United Nations. I am a United Nations ambassador for the Girl Child mission. So I will be talking about that,” the actor said. A row had earlier erupted over Bachchan’s participation in the second anniversary celebrations of National Democratic Alliance government with Congress targeting him and Prime Minister Narendra Modi in the light of the megastar’s name figuring in Panama Papers expose. “Jo nakaratmak baatein karte hai main unka swagat karta hoon. Kyunki kai baar jo woh bolte hai woh sunna chahiye, as we are not perfect human beings, hum sab mein khamiya hai. 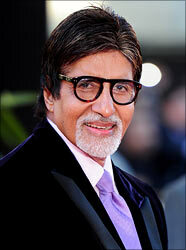 I never block or delete these people,” the 73-year-old actor said. The “Piku” star says he tries to tell people not to use abusive language. “But those who use abusive language I tell them there was no need to use this kind of language. If they improve, good, if not, then (I do) not listen to it. Ek maa kala tika lagati hai bache pe nazar utarne ke liye main inn sabko apna nazar batu samajhta hoon,” he said. Prime Minister Narendra Modi and most of his ministerial colleagues are expected to attend the event at India Gate on Saturday, where Amitabh will also host a small segment of the programme, to mark the government’s second anniversary. The government is organising the event-- ‘Zara Muskura Do’ (Smile Please) -- which will have several performances and programmes highlighting its “achievements”. The show will be beamed across the country by Doordarshan. Ganguly confirms: Bachchan charged nothing to sing national anthem!